I was searching for nice song to sing with a ukulele and then I remember, years ago, hearing a version of Judy Garland's 1939 song "Somewhere Over the Rainbow" sung buy a man with just a ukulele as accompaniment. So here I found it and I am glad to have learned about the man behind this beautiful rendition. Iz Kamakawiwo'ole, born May 20, 1959, was an American musician from Hawaii. His music became famous outside his homeland when his album Facing Future was released in 1993. His medley of "Over the Rainbow" and "What a Wonderful World" was featured in a number of movies, TV series and TV ads. It had millions of paid downloads, climbed international charts from 2004 to 2010. 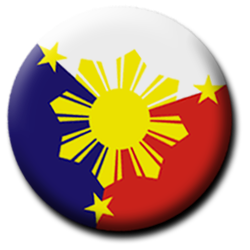 (It might have not gone mainstream in the Philippines?). Fourteen years after his death he was honored with a German national music award (Echo) in March 2011. Aside from being a singer/songwriter and a skillful ukulele player he was also known as a promoter of Hawaiian rights and Hawaiian independence. He is loved by many and thousands of people gathered to pay their last respect to the man as his ashes were scattered into the Pacific Ocean at Makua Beach in July 12, 1997. He was 38. You'll see that event in this video. Give it a listen. Quite relaxing. 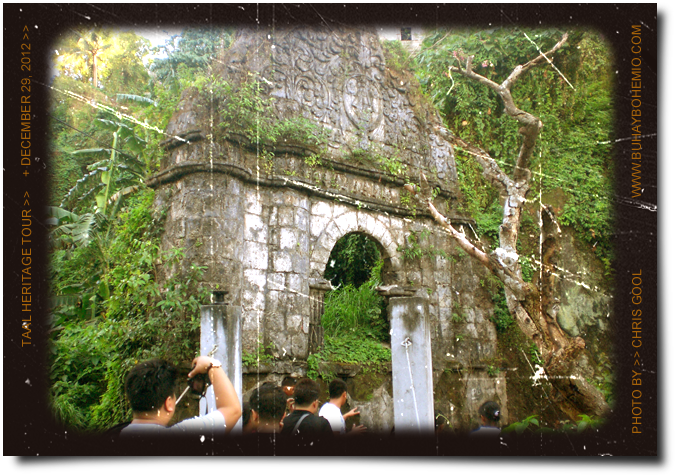 The last destination of our Taal heritage tour leads us to this small church in the town of Caysasay. The facade looks like it was just built a couple of years ago. But if you look at the rest of the building you can tell that it's a pretty old structure. They say that the original walls are made of coral stone. 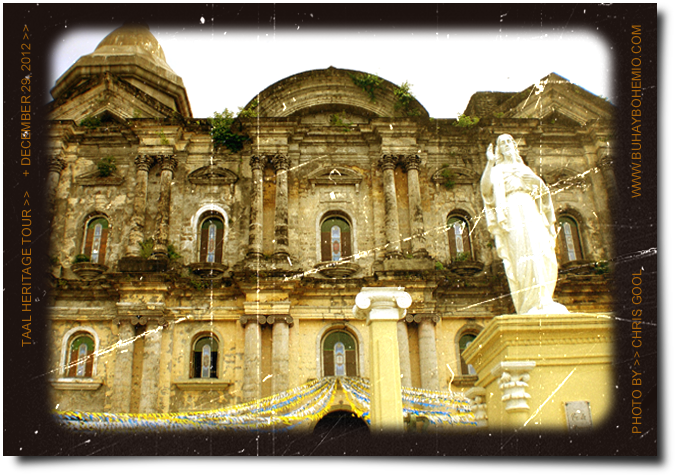 This church is named after the Nuestra Señora de Caysasay, a miraculous wooden statue of the Virgin Mary that was found in the nearby Pansipit river by a fisherman named Juan Maningkad in 1603. Photos by me and Don Triviño. 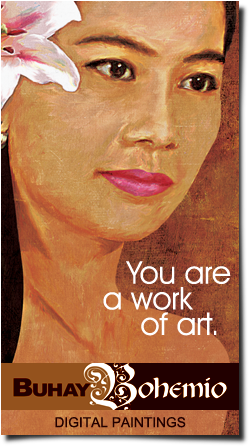 Click on the small images for a closer look. 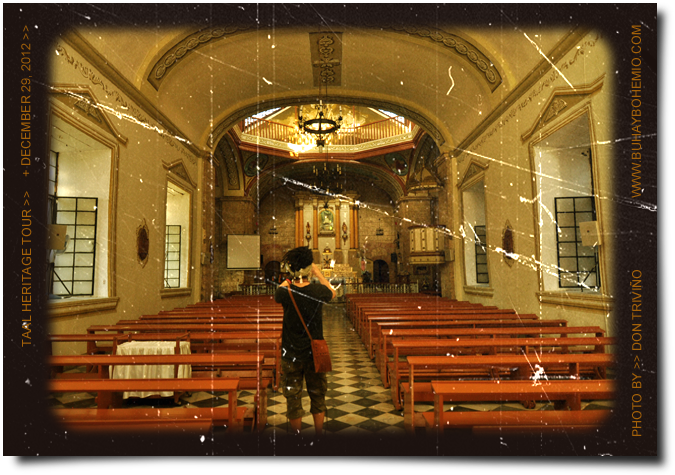 It may not be as grand as the Taal Basilica but this small church has it's own rustic charm. 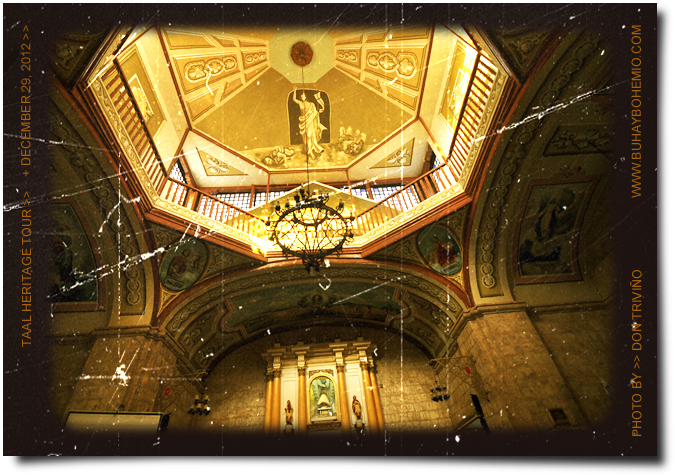 Ceilings painted with religious images and trompe l'oeil is a trademark of old churches. 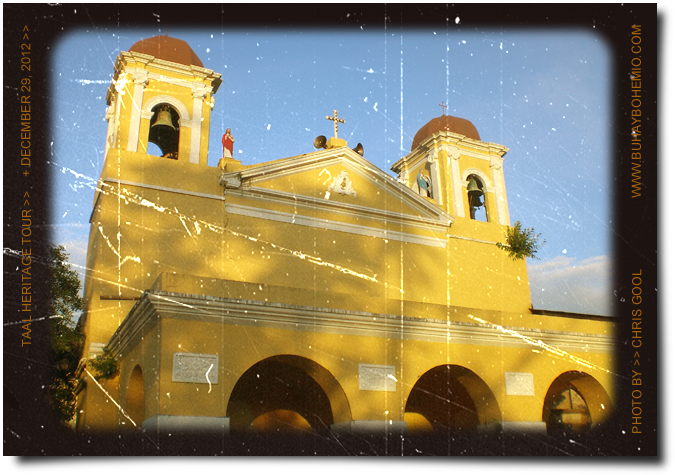 This is a large print of the Lady of Caysasay that hangs inside the church. The wooden statue, without the halo, crown and vestments is only 11.5" (including the base). It may be small but it is one of the oldest Marian statues in the country. A replica statue is placed high above the altar in the church. 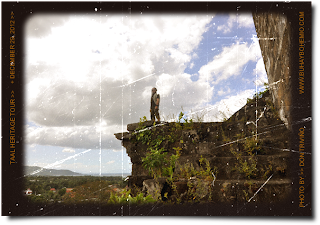 To see how the original statue looks like the way it was found in 1603, click here. 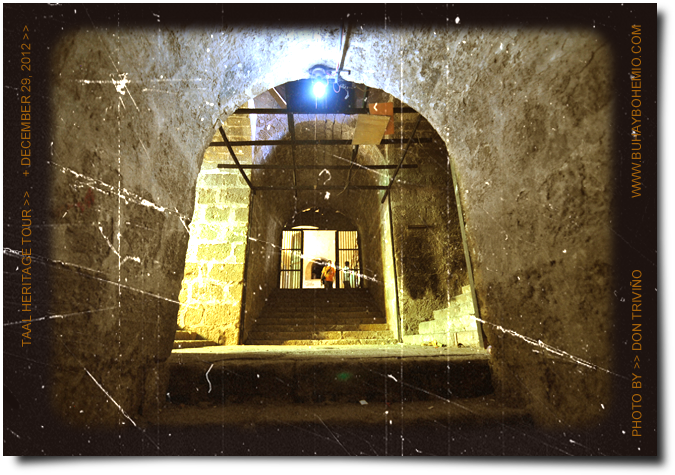 You can read the story about it's finding, the mysterious disappearances, miracles and the apparitions in Caysasay on wikipedia. 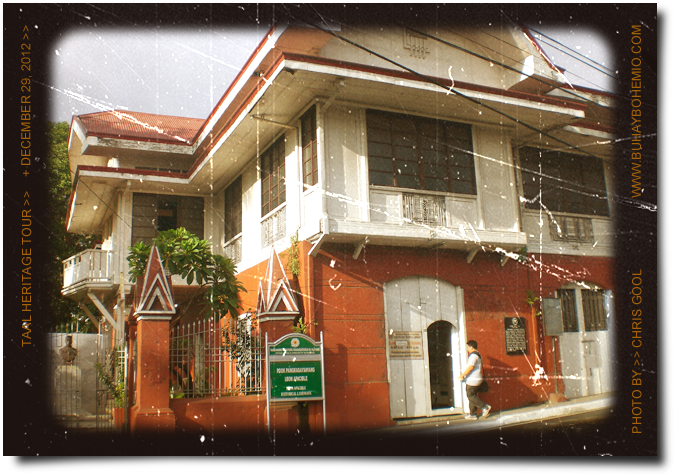 This shrine, known as Sta. Lucia Wells, is built on the Caysasay spring which is a short hike from the church. 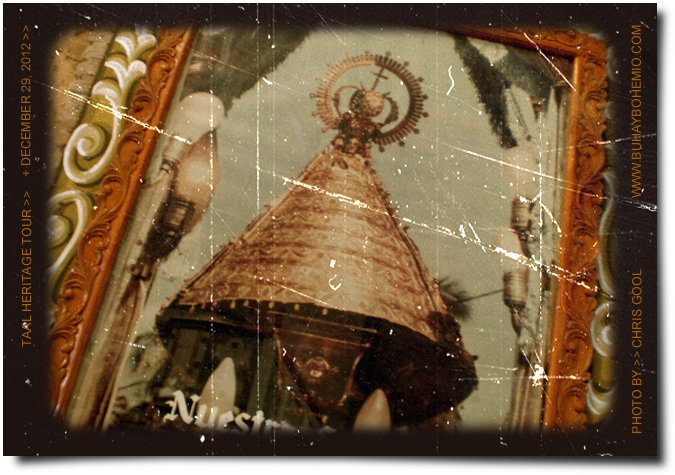 Stories say that the Virgin appeared as a reflection in the spring. 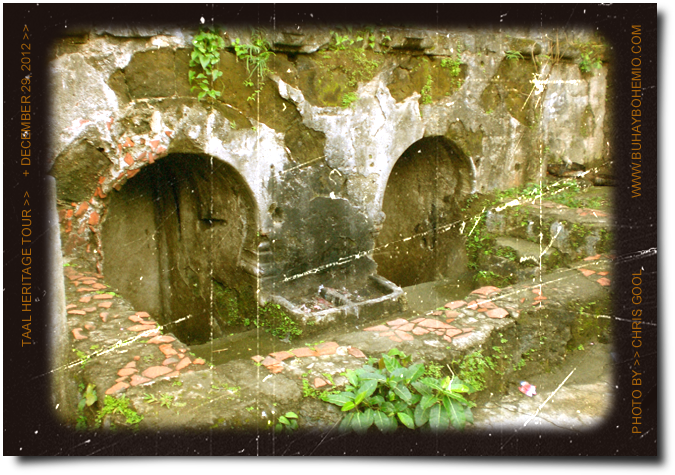 At the base of the arch shrine are two openings of the well where spring water is collected. It is said that the water from this well can miraculously heal sicknesses. 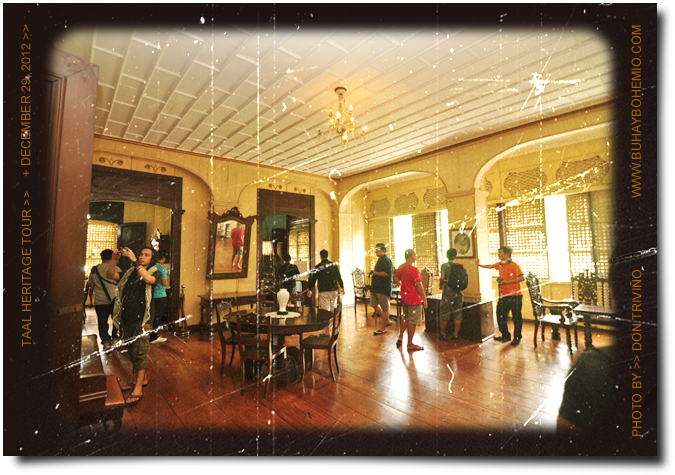 So that concludes my Taal heritage tour that took place December 29 last year together with friends and some travel bloggers. 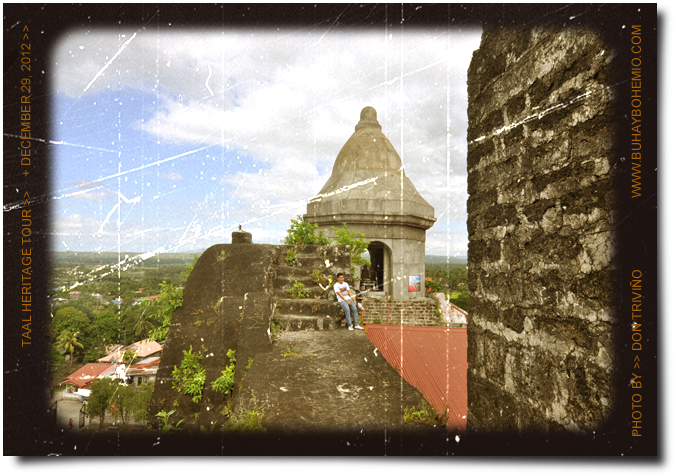 I hope these few pictures inspired you to visit Taal and experience in person the feeling of being brought back to Spanish times, the spirit of patriotism and faith. Here's another old house turned museum. 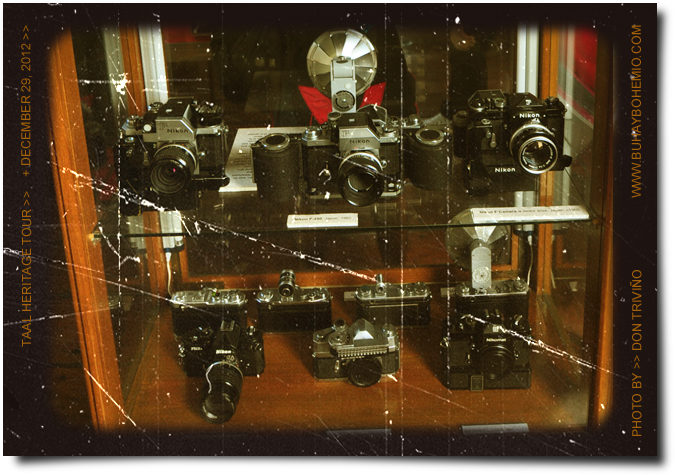 You will find here a vast collection of vintage cameras from the late 1800's to 1900's also antiquarian photographs of the 1800's, the American occupation, WW2, and the Libaration period. 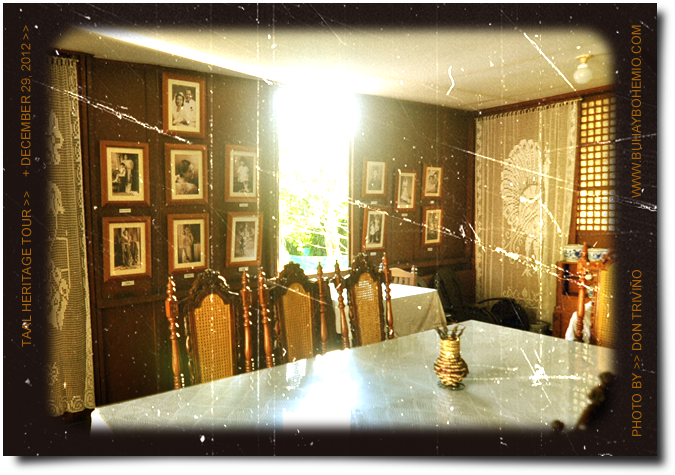 The cameras are a personal collection of Manny Inumerable, grandson of the original owners of this beautiful house. 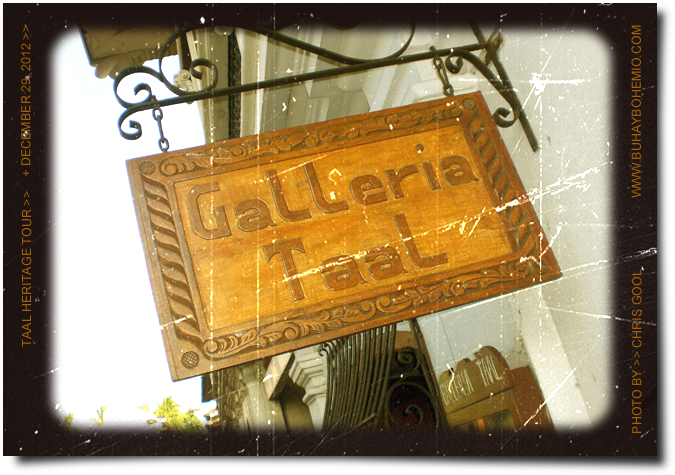 Galleria Taal is located along Agoncillo Street. 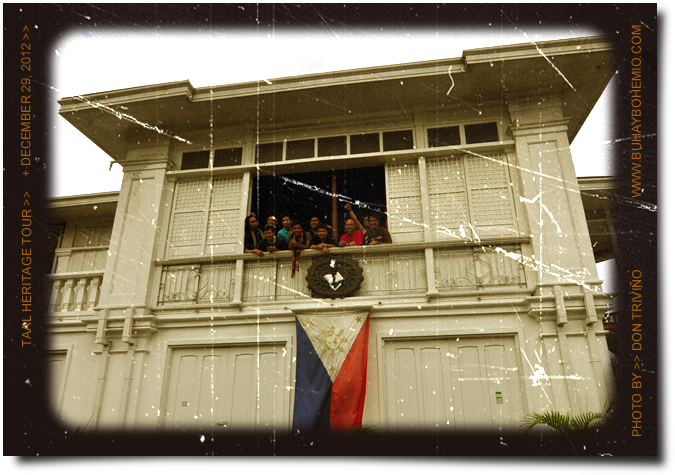 Just a few meters from the house of Leon Apacible. Every single camera that you find here is still functioning. Manny repairs them himself. 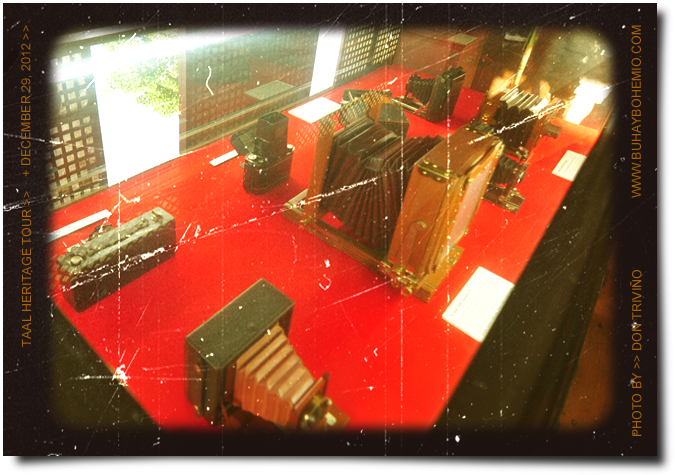 You will also find modern day cameras here too. From the 30's to the new millennium. 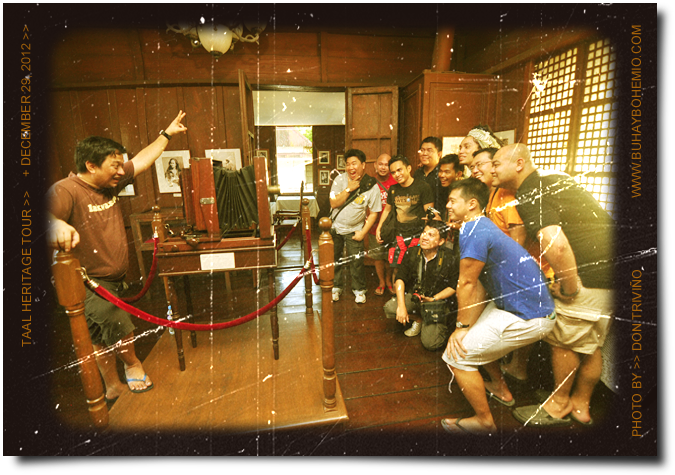 It would have been awesome if this big instantograph camera has film in it. 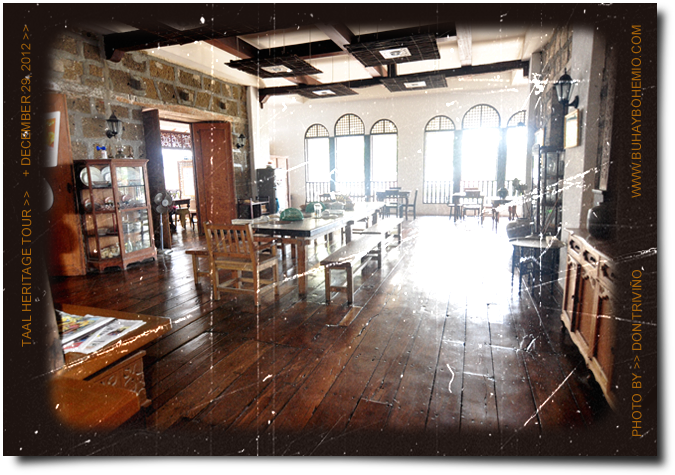 If you are not a camera junkie, simply enjoy the vintage photographs and of course the architecture of the old house. Manny and his brother Bobby put a lot of effort in preserving their ancestral home. Leon Apacible was a lawyer, judge and a revolutionary in the 1890's. 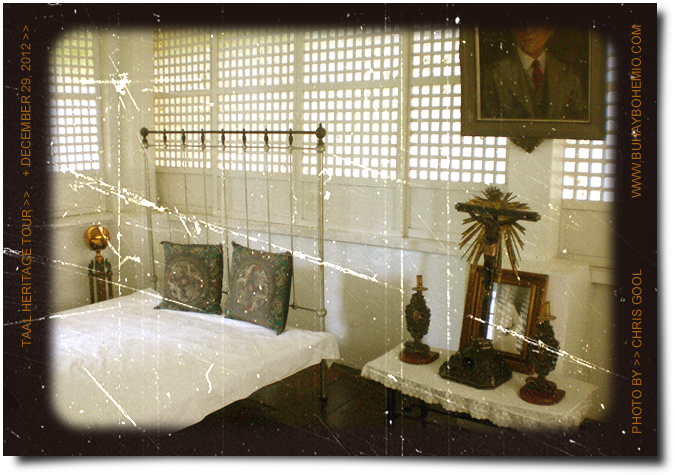 He was appointed by Emilio Aguinaldo as finance officer of Batangas, and then a delegate of the Malolos Congress. 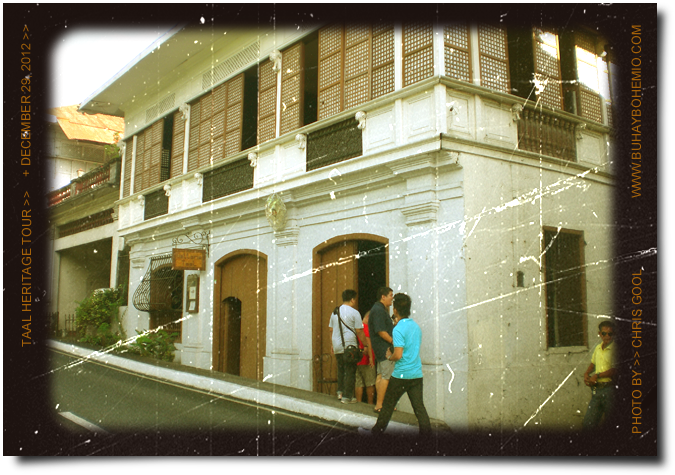 This house is where he lived and it was a meeting place for Filipino heroes like Jose Rizal and Mariano Ponce. 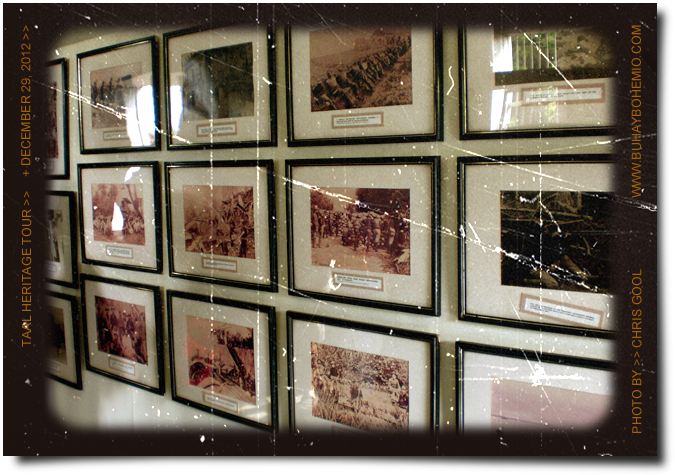 At the ground floor you will find some artifacts and these photos from the Philippine-American War. Check out the interior. So brown. 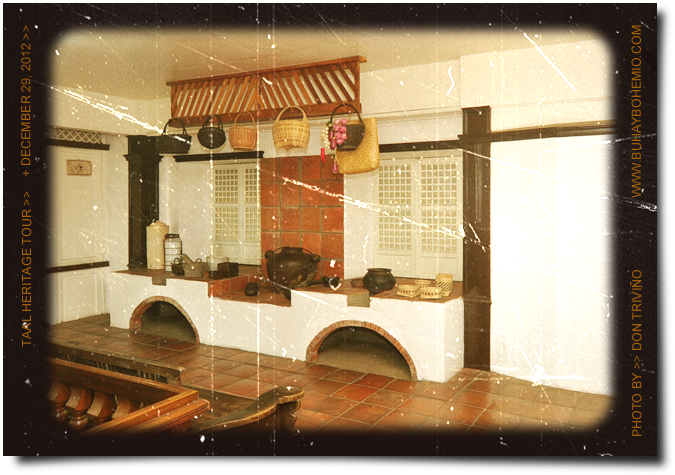 Houses from this period always have a second floor that is made entirely of wood while the ground floor is made of adobe or bricks. Again the bed is at the center of the room. I wonder if that's where it really was back then. I love the kitchen! Look at that built-in firewood stove! You guys aren't tired of old houses, are you? Well there's one more coming up. LOL! 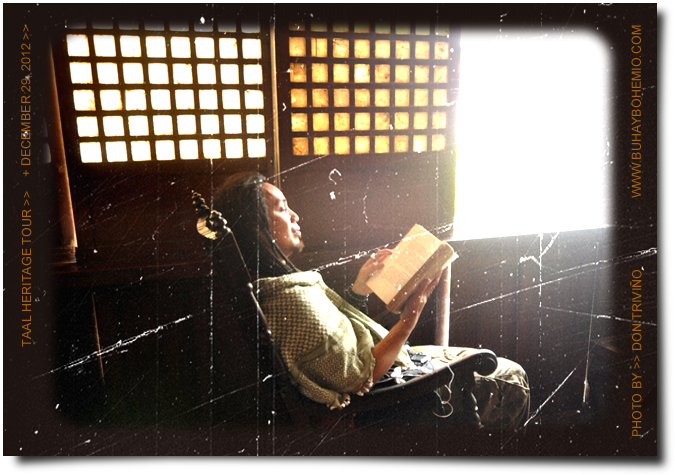 So who is Marcela Mariño Agoncillo? 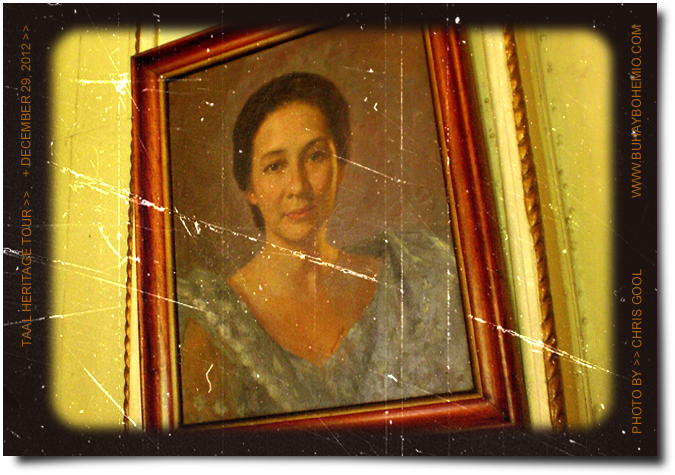 She is the wife of the honorable Felipe Agoncillo (uncle of Gregorio Agoncillo, whose house we just visited). 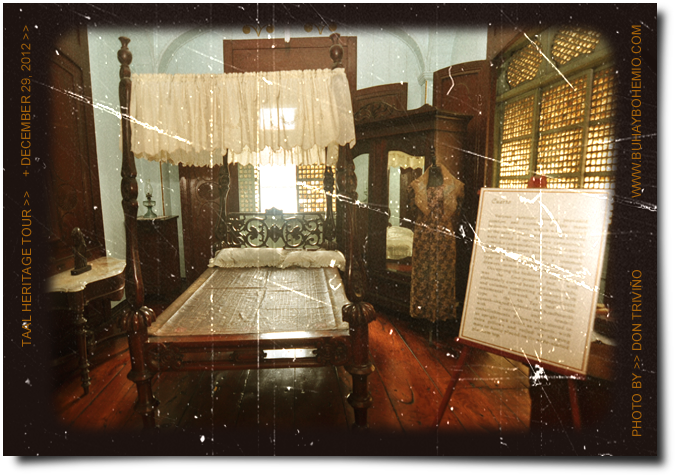 Marcela is known as the seamstress of the very first flag of the Philippines, the one that General Emilio Aguinaldo waved in Cavite in 1898. 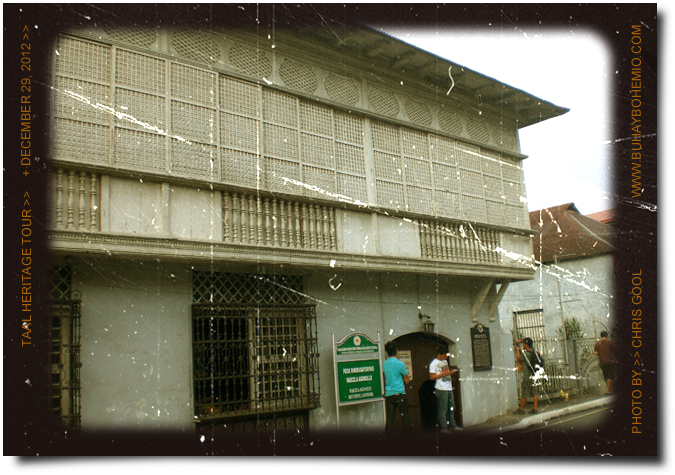 This house turned museum, was built in the late 17th Century by Marcela's grandfather. 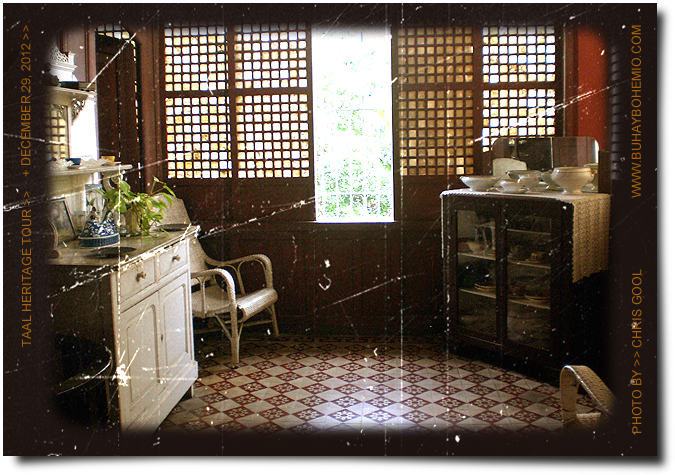 Heirs donated this house to the national government and is being maintained by the Department of Tourism. 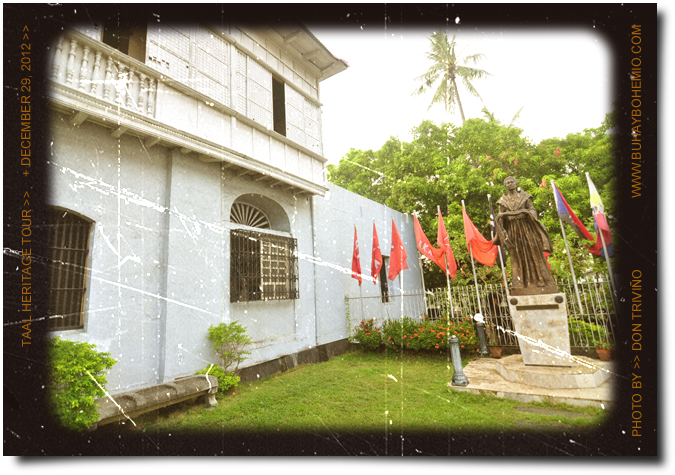 Beside the house, at the right, is an open space where a bronze statue of Marcela stands before an array of Katipunan flags. 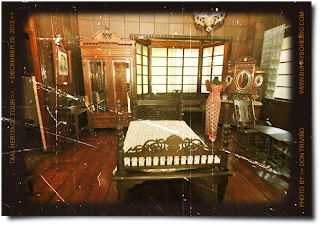 At the lower floor of the old house is a small exhibit that features some artifacts and literature about the lives of Felipe and Marcela and their contribution to Philippine history. 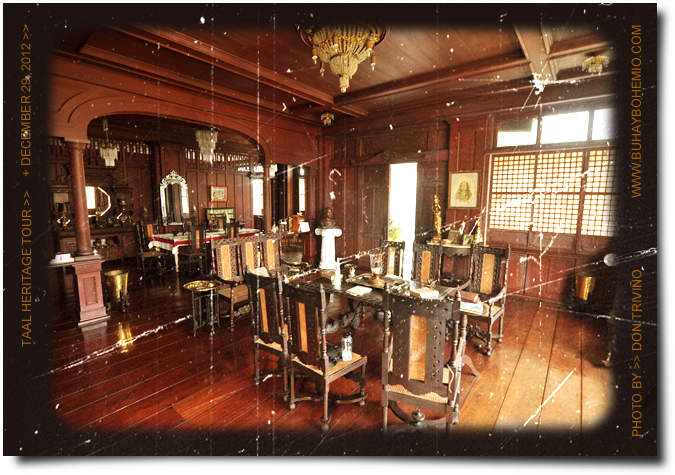 Houses of well off families of this period have spacious living areas on the 2nd floor. 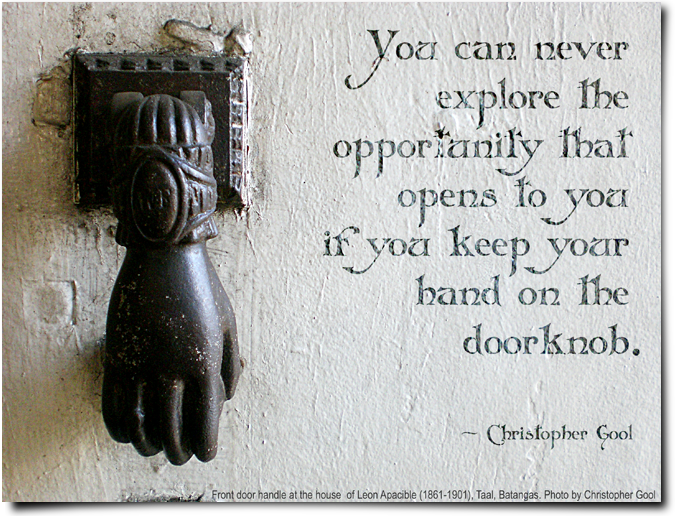 The ground floor is usually for business or utility. Check out the cool four post bed! I couldn't help but notice that beds are always placed at the center of the room. 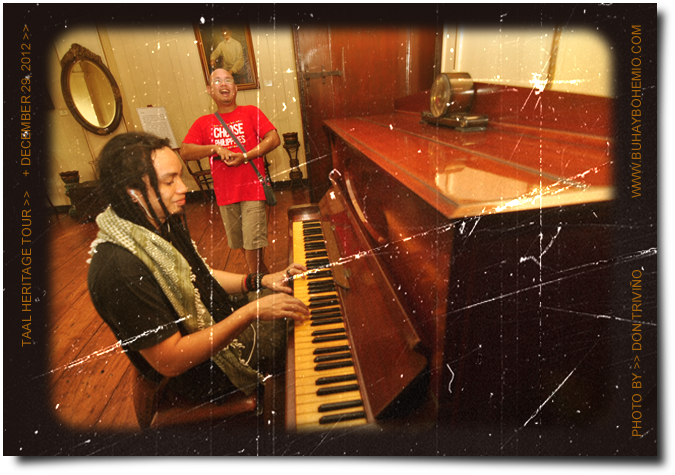 It's amazing that every key of this piano is still working and in tune! 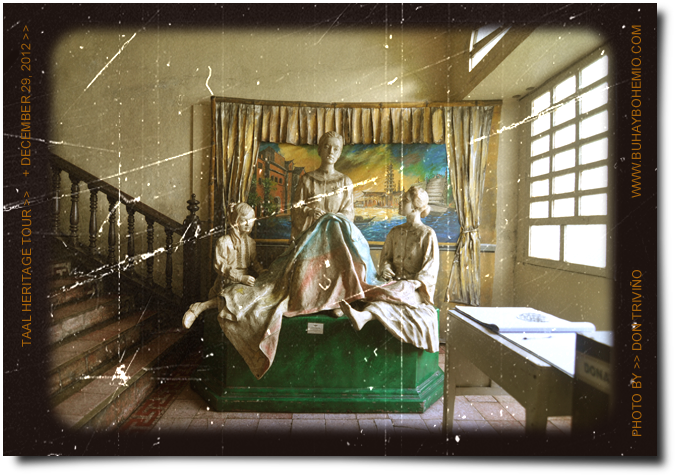 Above the piano is this painting of Doña Marcela. 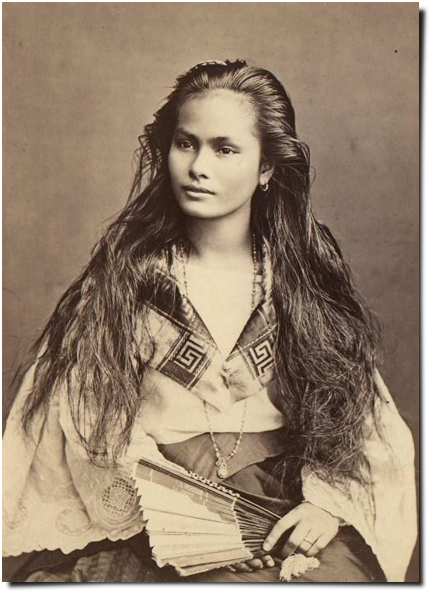 She was indeed a charming woman. A very supportive wife and a dedicated mother, benevolent and a source of inspiration to people of her time and even today. Read about her life here. 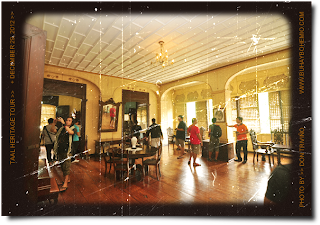 Last month on the 29th, even if I had some work to do, my friends were able to persuade me to go with them, along with other travel bloggers, on a heritage tour in Taal, Batangas. The last time I visited the Basilica de San Martin de Tours was in March last year and there were areas in the old basilica that I didn't get to see. Now this recent visit was a mini adventure. The kind that is not fit for those with acrophobia and claustrophobia. 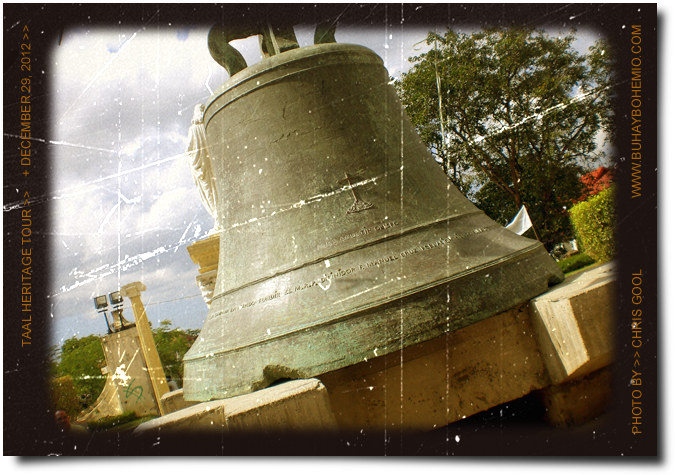 The Taal Basilica owns the largest bell in the Philippines. It's 6.42 ft in height and 19 ft circumference at the lip. It is not being used anymore and is placed on a platform in front of the basilica. This is, I think, the living quarters for the clergy. 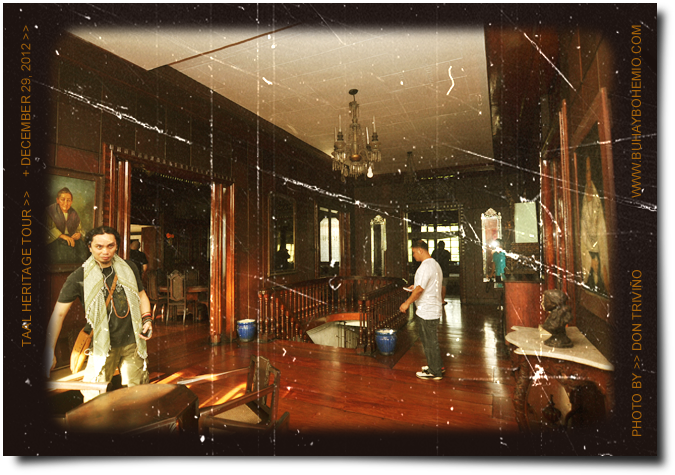 It looks like Padre Damaso will just walk in any minute. Stone walls, steps and vaulted ceilings will lead you to the stain glass windows that you see at the facade of the basilica. 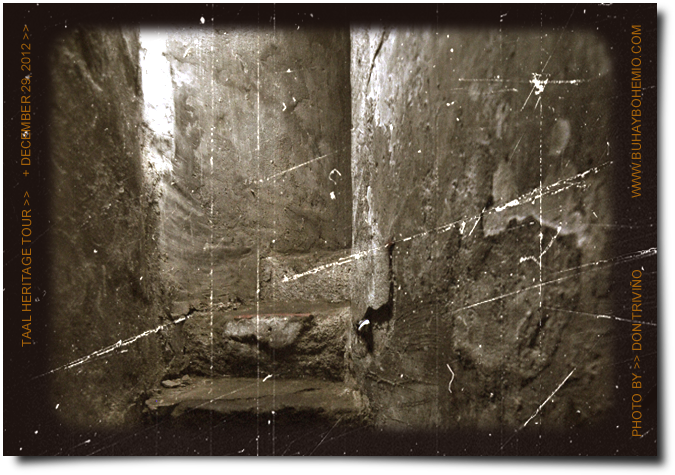 A dark and narrow stairway leads to the belfry. For Php 50 you will be given access to the belfry and the basilica roof. There are no safety railings so one wrong move can send you about 20 meters to the ground. That's me standing on the upper right corner of the basilica's facade. It was a bit scary. 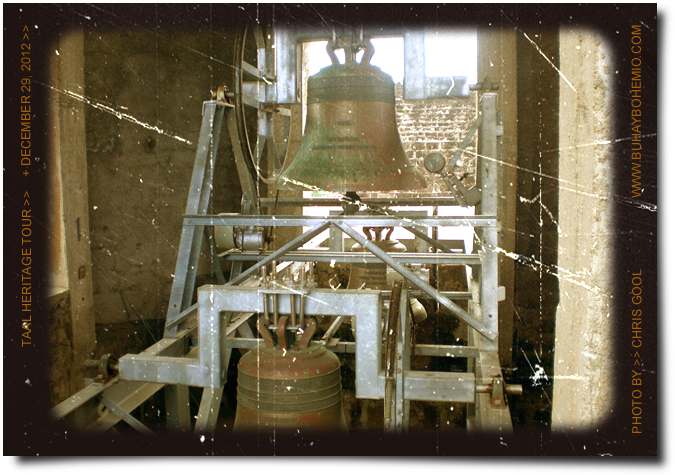 The bells. The old gigantic one is replaced a by couple of smaller ones. Not sure if there are more. 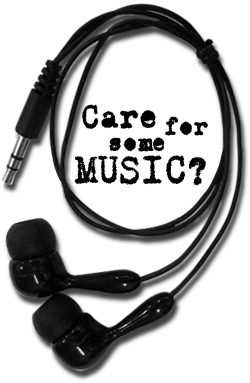 They are electronically operated. 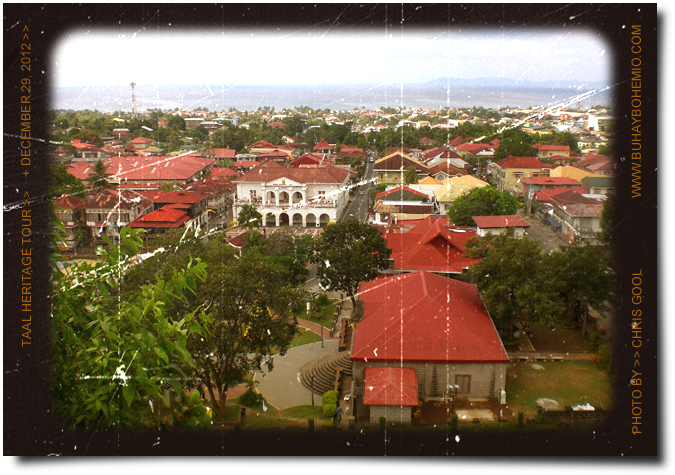 From the top of the basilica you'll get a really nice view of the municipality because the old church is quite a tall structure that is built on a high place in Taal. And there's more to see in this beautiful historic place. 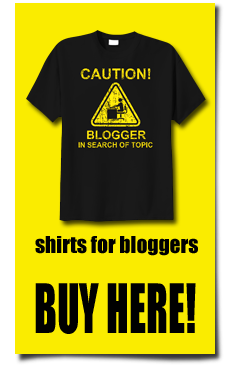 Check out the coming posts! 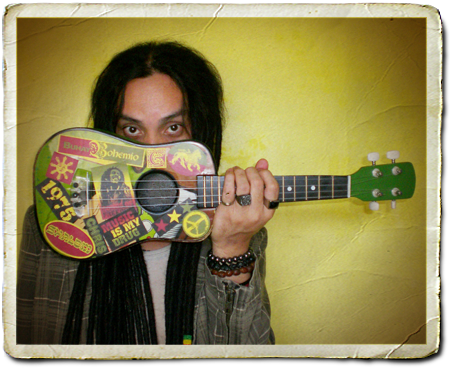 I got this ukulele as a gift from my dear sister last Christmas. It's actually one of the best gifts I got last year. She probably didn't know that I also wanted a ukulele but getting one is really at the bottom part of the list. I've been meaning to buy a new acoustic guitar as a gift to myself for Christmas but I think I'm gonna delay that a bit because I'm really enjoying this new instrument. Ukuleles are commonly associated with Hawaiian music. 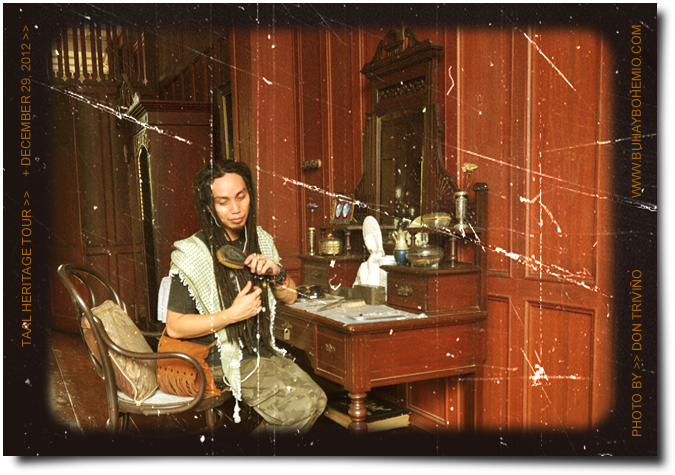 It is based on two small guitar-like instruments that was brought to Hawaii by Portuguese immigrants in the 1880's. 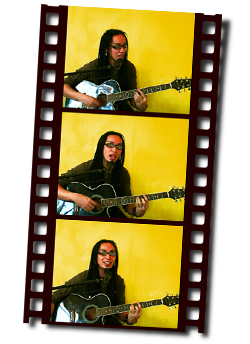 Now here's a little trivia: Japan today is the 2nd home for Hawaiian musicians and ukulele virtuosos. It all began when a Hawaiian-born Japanese guy named Yukihiko Haida introduced it to Japan when he went there upon his father's death in 1929. And despite the authorities' ban on Western Music in World War II, the good ol' ukulele survived because fans played them in secret. I simply love the sound this instrument makes. It's jolly and rustic. 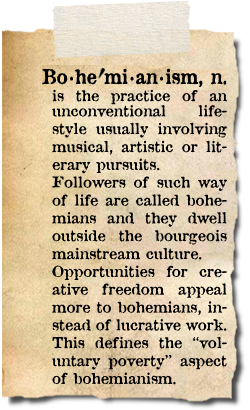 It's bohemian! 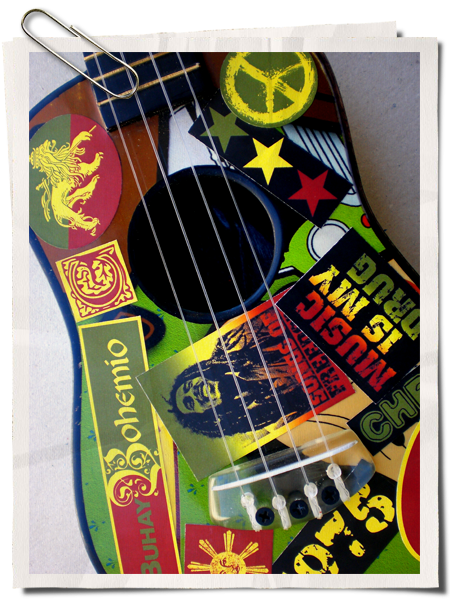 I've put customized reggae inspired stickers on it to hide the print of the cartoon version of Mr. Bean. LOL! Do you see him? How about his teddy bear? hehe. My sister said there was no plain colored ukulele at the store when she was shopping for it and this is the better looking one. The other one probably has a Power Puff Girl print. LOL! But I'm really glad she got me one. Thanks sistah! Anyways, learning to play the uke is quite easy especially if you already know how to play a guitar. 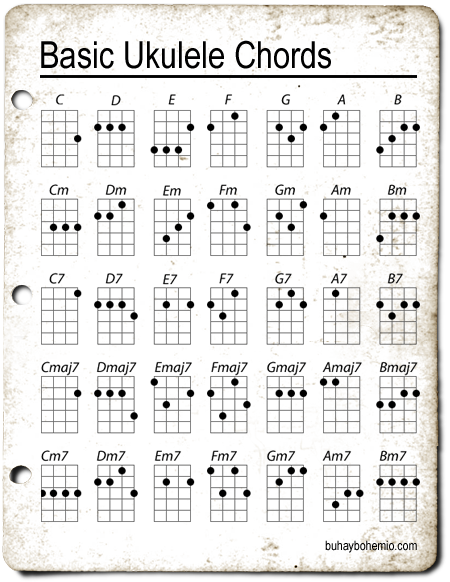 Because the uke has only 4 strings, the chord pattern is different from that of a guitar. Before, I thought that the uke only has the last 2 bottom strings of the guitar omitted hehe. 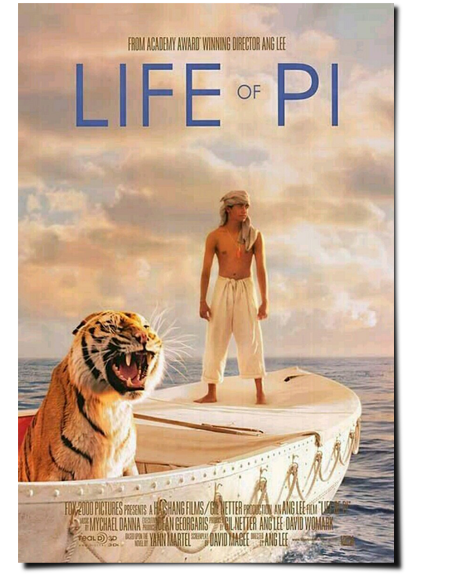 My friends invited me to watch Life of Pi last night and this is my first movie of the year. And again here's another novel that I only get to learn about when a movie adaptation shows up. The novel by Canadian writer Yann Martel actually got rejected by at least 5 publishing houses before its was published in September 2001. So this movie, directed by Ang Lee, is about an Indian boy who survived a shipwreck and had to share a lifeboat for 227 days with an adult male Bengal tiger. The movie is actually a good watch. Despite the long at-sea scenes, amazing CG effects will certainly not bore you. You will marvel at the picturesque beauty of the ocean and the monstrosity of it during a thunderstorm. Not only is this a movie about survival but also about one's philosophy on why he believes in God. So if you want to be inspired, go watch this movie! Six shirts from just one customer, ordered last Wednesday. Good thing I'm done with the projects of last holiday when his orders came in. Originally, my client intended to have a portrait done for their boss, who's leaving their team this month, and they would like to give it as a farewell gift. 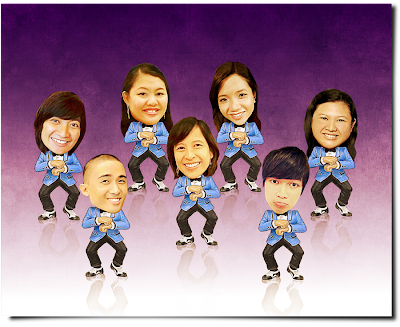 But instead, they decided to give their boss a caricature of their team of 7 people, doing the Gangnam Style dance. What do you think? This is actually my first caricature work. I'm not really a fan of this style of portraiture but I admit it's quite entertaining to look at those exaggerated facial features of famous personalities done by known caricature artist such as Sebastian Kruger and David Levine. Caricature is meant to make the subject look funny but the thing is not everybody wants to look funny. 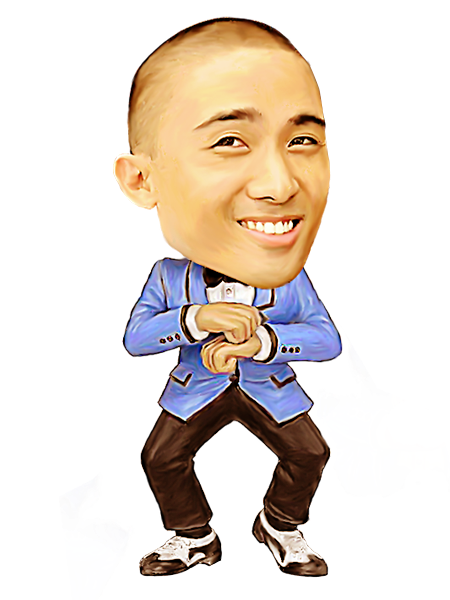 So the typical caricature portrait you'll find simply illustrates a person having an enormous head, minus all the other distortions. This is to be safe, I suppose. I mean, a gift-giver doesn't want to end up offending the recipient, right? Hehe. 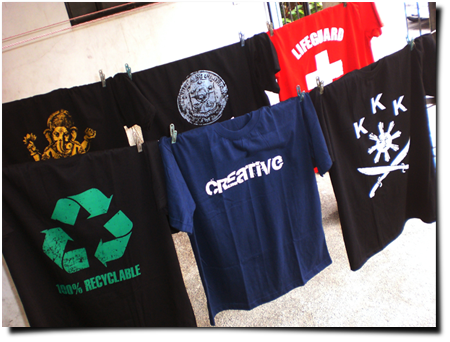 I printed these 25 shirts on the first week of January but I had been working on the pre-printing process in the holidays. I actually burned the screen an hour after New Years Eve. Yup I've been printing shirts side to side with making digital portraits. I printed in the daytime and worked on digital images at night. 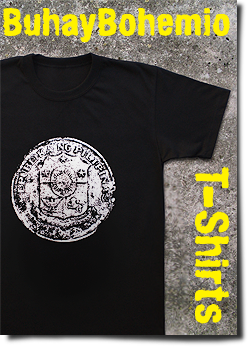 I remember that I had to ignore some inquiries for BuhayBohemio shirts. Haha. I got back to them a couple of days ago. Fitz, my partner in Blogger Shirts, got us this project. 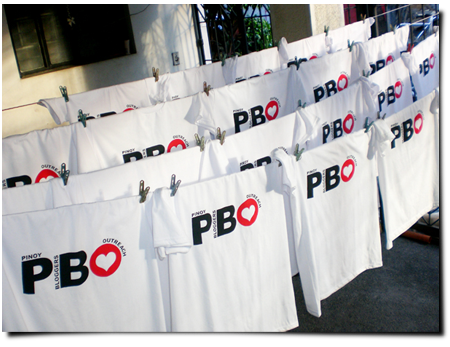 It's an event shirt that a group of Pinoy bloggers will wear on an outreach program. It will be held next week, I think. It's nice to know that a group of bloggers out there are reaching out to our less fortunate kababayans early in the year. In the height of making digital portrait paintings, I was able to discover how to produce, digitally, a more 3-dimensional effect. 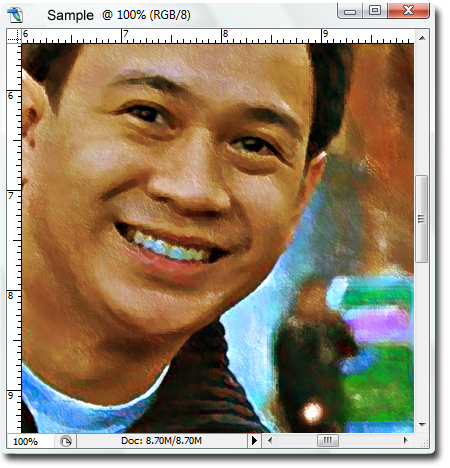 One of the software I'm using amazingly create brush strokes that has highlights and shadows - giving the effect of thick oil paint. Another effect is that light colors seem to be placed above dark colors, giving the image a kind of depth that is distinctive of oil paintings. However this technique is best appreciated when printed on photo-paper, compared to canvas. On photo-paper you see the image exactly as how you see it on screen. But on canvas, the texture of the material kinda blurs out the 3-dimensional effect. I guess when printing on canvas, the image needs to be sharpen a bit with the use of filters.